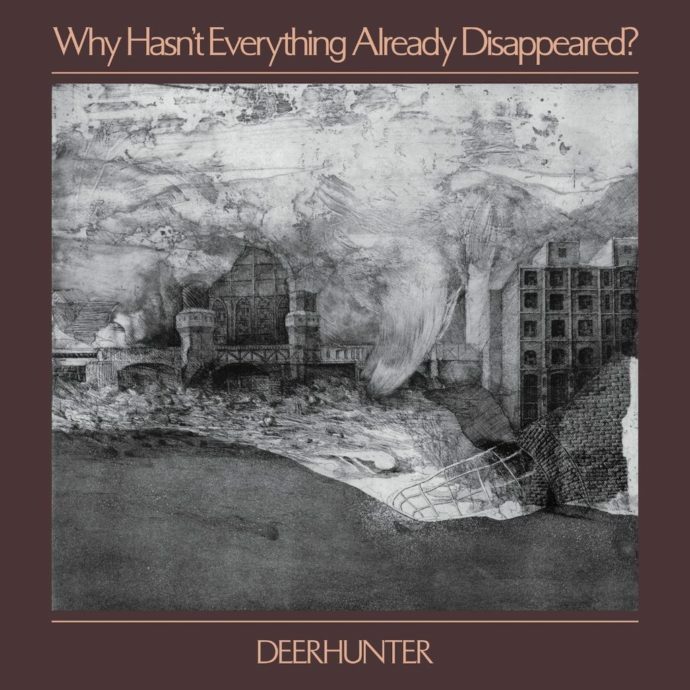 Why Hasn’t Everything Already Disappeared?, the eighth studio album from Atlanta indie band Deerhunter, is a pleasant mix of traditional rock instrumentation and psychedelic weirdness. The record’s first single (which also happens to be the opening track), “Death in Midsummer”, while at times bleak lyrically, is an otherwise welcoming number that gives off enough of an otherworldly vibe via the whooshy synths that appear under a lazer-like guitar solo, that listeners will immediately get a good idea of what they’re in for during the next half hour. The harpsichord and eerie synths that appear on “Death in Midsummer” continue into “No One’s Sleeping”. Additionally, a brass section falls in neatly without ever taking the listener out of the album’s dreamy escapist vibe. As the record progresses, each song smartly adds sonic touches both familiar and exotic. The Gary Numan-esque keyboards on “Greenpoint Gothic”, the lush harp on “Element”, and the Laurie Anderson-like spoken word vocals on the oddly beautiful “Détournement” all help establish a sonic world that’s at once strange yet familiar. Not all the songs on Why Hasn’t Everything Already Disappeared? are as unusual as the prior descriptions suggest, however. “What Happens to People?” is a straightforward, upbeat, mid-tempo track that does a good job sequentially by bridging the gap between the record’s first and second halves. In addition, “Futurism”, with its stomping beat and plainly delivered lyrics by Deerhunter’s oftentimes idiosyncratic-sounding singer, Bradford Cox, have the band sounding downright mainstream comparatively. Why Hasn’t Everything Already Disappeared? gets pleasantly weirder during the album’s third act. “Tarnung” utilizes a hypnotic pattern played on a xylophone along with a sax to create a gently soporific backdrop for cooed lyrics like, “When the day goes dark, objects of the night, mirrors for the light, call for me to come outside.” The record’s penultimate number, “Plains”, starts with a firmly grounded synthesizer and polyrhythmic percussion combo before exploding into a floating, dreamlike soundworld during the song’s eccentric chorus. The album’s final moment, the epic six and a half minute “Nocturne”, pulls out all the stops. Cox’s overmodulated vocals get clipped as if his microphone is going in and out, guitars are replaced entirely by pianos and quirky keyboards, and yet the band manages to roll the entire peculiar concoction into a resoundingly joyous conclusion. “Nocturne” is an appropriate ending, one that feels earned, as if Deerhunter has been preparing the listener for this moment from the record’s beginning. Overall, Why Hasn’t Everything Already Disappeared? manages to be both accessible and unconventional, often at the same time.